In pitch darkness early Monday, Army Pfc. Hannah Leah McKinney of Redlands climbed down from a guard tower at Fort Taji, Iraq, and headed across a dusty road to a latrine. She never made it. As she walked across the road, a Humvee drove out of the darkness, ran over the young soldier, then sped away, leaving her small crumpled body lying in the dirt, according to family members. In pitch darkness early Monday, Army Pfc. Hannah Leah McKinney of Redlands climbed down from a guard tower at Fort Taji, Iraq, and headed across a dusty road to a latrine. As she walked across the road, a Humvee drove out of the darkness, ran over the young soldier, then sped away, leaving her small crumpled body lying in the dirt, according to family members. More than an hour later, a tank driver found her and rushed her to the base medical center, where she died of internal injuries. Death came two months before McKinney, 20, was due to return to the Redlands family the young mother had pined for during her deployment. "The war had been taking a toll. She had been depressed and calling home a lot," said her mother, Barbie Heavrin. "All she wanted was to come home and start a new life." Since her deployment to Iraq in November 2005 with the 542nd Maintenance Company, 44th Corps Support Battalion, McKinney served as a quartermaster at Fort Taji. Her duties included order processing and manning a machine gun on a guard tower at the base, the job she was doing when she was killed. Sgt. Jeremy Pitcher, a spokesman for Multi-National Force-Iraq in Baghdad, refused to comment further on her death, saying it was still under investigation. McKinney was born to Matt and Barbie Heavrin in 1985 at Western Medical Center in Tustin. Growing up in Colton and Redlands as one of the couple's four children, she was a cheerful child nicknamed Happy Hannah. "She was always making us laugh. One time at Huntington Beach, she was sitting by a campfire eating potato chips when she said, `Dad, these chips don't want me to eat them anymore,' " recalled Matt Heavrin. At Paul J. Rogers Elementary School in Colton, she read every book she could get her hands on. Her favorite was "Gone With the Wind." "She read it about 12 times," said Matt Heavrin. "I think she identified with Scarlett O'Hara because they were both very decisive and strong-headed." 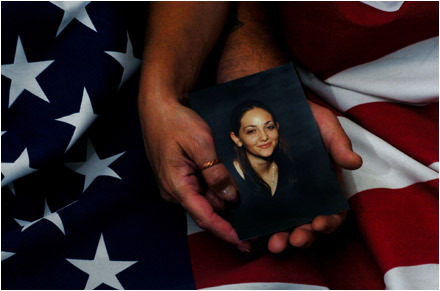 But for chance, McKinney's life might have ended nine years before she died in Iraq. While riding her bicycle in Redlands at age 11, she was struck by a car. The impact split her helmet in three places and sent her flying into the windshield. "She was so excited about starting school at Arrowhead Christian Academy that she nearly left without her helmet that day," said her father. "Thank goodness she remembered because she only ended up with a concussion, scrapes and bruises." At the academy, she joined the choir and drama department, where she would have loved to play Scarlett but never got the chance, said Barbie Heavrin. She continued to belt out tunes as a student at Redlands High School and also pursued an interest in fashion design. Against her father's wishes McKinney joined the Army right out of high school to earn the money to go to The Fashion Institute of Design and Merchandising in Los Angeles. "I tried to talk her out of it because she was more of a free spirit than a regimented person," he said. 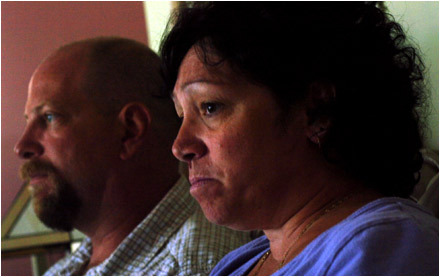 "The thought that she might get sent to Iraq was also in the back of my mind." At Fort Lee in Virginia she dated a fellow soldier and became pregnant with his child. She was discharged from the Army in 2004. She returned to active duty in 2005, and a long friendship she had with fellow Redlands High School graduate Christopher McKinney blossomed into romance when both were stationed at Fort Lewis, Wash. They were married just a month when the Army shipped her out to Iraq. Now, her husband, 22-month-old son Todd Avery Gunterman, parents and siblings mourn her loss. Christopher McKinney, still stationed at Fort Lewis, was is in Redlands to make arrangements for the funeral. "I will miss her beautiful dimples when she smiled, but at least we still have her son," said her mother. At Fort Taji she will be remembered as the young soldier who started a library on the base. "I'm sure it has a lot of copies of `Gone With the Wind,' " said Barbie Heavrin. A public viewing will be at 9 a.m. Thursday. Memorial services will follow at 10 a.m. at Immanuel Baptist Church, 28335 E. Baseline, Highland. McKinney will be buried with full military honors at Riverside National Cemetery. Staff writer Debbie Pfeiffer Trunnell can be reached by e-mail at deborah.pfeifferor by telephone at (909) 386-3879. Barbie and Matt Heavrin, of Redlands, hold a photo of daughter Hannah Leah McKinney at their home in Redlands. Pfc. 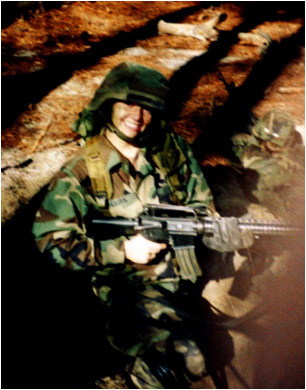 Hannah Leah McKinney at boot camp in South Carolina in 2003. Pfc. McKinney, 20, was a quarter master who died in Fort Taji Iraq on September 4, 2006. A photo from early 2006, shows Pfc. 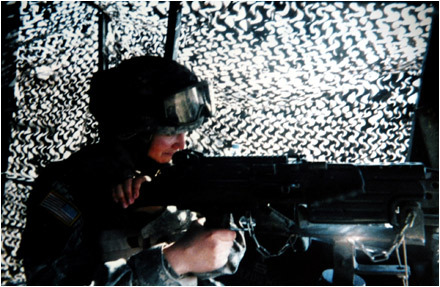 McKinney in her final role as guard duty in a tower at Fort Taji, Iraq. "I miss her dimples when she smiled," said Barbie Heavrin of her daughter. Hannah's father Matt is at left. Matt and Barbie Heavrin grieve the loss of their daughter Hannah McKinney from their home in Redlands September 7, 2006. 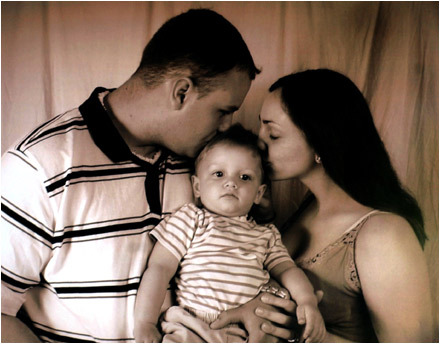 A family photo shows Chris McKinney, 21, with Hannah, 20, and son Todd, 22 months, as seen May 2006. The couple had been married for 11 months. Hannah leaves behind a husband, son, two parents, and three siblings. Listed below are the 10 latest comments of 44 posted about this article.